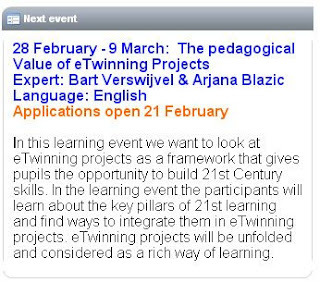 Today I'm proudly announcing and inviting you, dear readers, to take part in the learning event The Pedagogical Value of eTwinning projects, which I'll be running with my Belgian colleagueBart Verswijvel in the Learning Lab from February 28- March 9. This is the first time that I'm running such an event, and also the first time that a Croatian educator is doing it. Learning Events are short online courses aimed at improving teachers' skills and putting them in touch with other eTwinners. Learning events take place in a specifically designed platform called theLearning Lab. Our learning event is about technology, but technology that is used only as a means to achieve the learning goals set by the teacher and to develop students' 21st century skills. Becoming a Webhead (BaW), a hands-on workshop on how to use web 2.0 tools in the classroom, is EVO's longest running workshop. This year, the BaWers are celebrating their 10th anniversary. BaW represents an excellent way to get started with new technologies in education. It encourages teachers to pursue new ways of teaching and to bring changes into their classrooms.